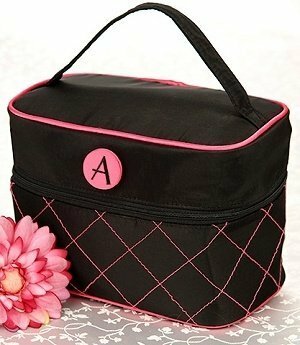 Your bridal party will travel in style with our sleek and sophisticated urban-inspired cosmetic bag. Includes a monogrammed pink satin button so you can make it personal. 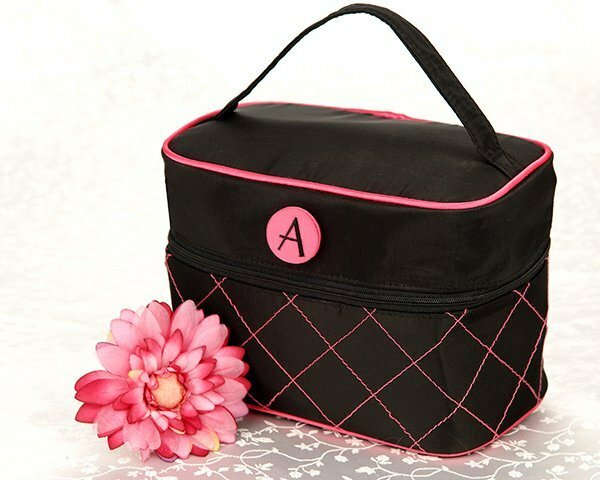 The outside is made from easy-to-clean black polyester, and features pink satin piping and fun criss-cross embroidery pattern accents. To keep the delicate contents inside safe, it's made from a crush proof design and stands 5.75" H x 8.5"L x 5" D. Includes handy carrying strap too. Note: Not all monogram letters are available, click "View Options" below to see complete list.